How Far Back Can You Claim R&D Tax Relief? Home » How far back can I claim R&D tax relief? You have two years from the end of your accounting period to submit a research and development (R&D) tax credit claim for any qualifying expenditure that you’ve identified during that period. This is because R&D tax credits are a Corporation Tax relief and the deadline for amending your Corporation Tax return is typically 24 months after the end of your accounting period. Accounting periods are usually twelve months long. 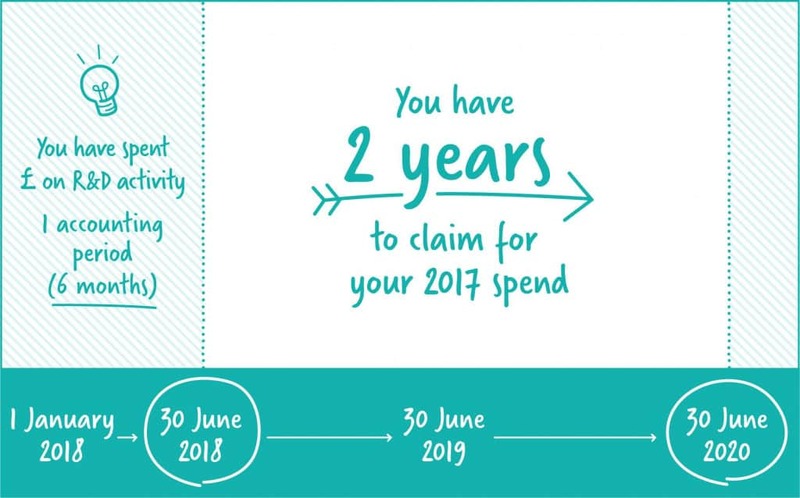 If, for example, if you file accounts to 31 March each year, you have until 31 March 2020 to make a claim for your accounting period ended 31 March 2018. 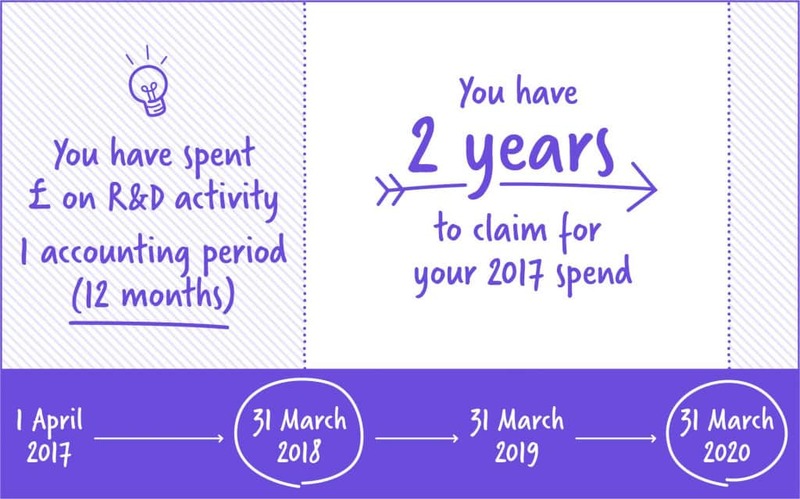 Once you hit the deadline at midnight on 31 March 2020, you can no longer recoup the money you spent on qualifying activities between 1 April 2017 and 31 March 2018. This may be different if you are a start-up in your first year of business. When you register your business with Companies House, your incorporation date is set at that nominated registration date. The first accounting period is set as twelve months from the end of that month. However, this may not be a convenient date going forward. Commonly, businesses will move their accounting year-end date to something more appropriate to their commercial seasons. Indeed, a large number of UK companies find it convenient to use 31 March as the end date for their business year so that it is the same as the tax, or fiscal, year. Therefore, in your first year of business, your financial period may be anything from 6-18 months long (diagrams: 6 month period above, 18 month period below). This means that your first two accounting periods as a business (for which you are able to claim) may not be two (twelve-month) years. 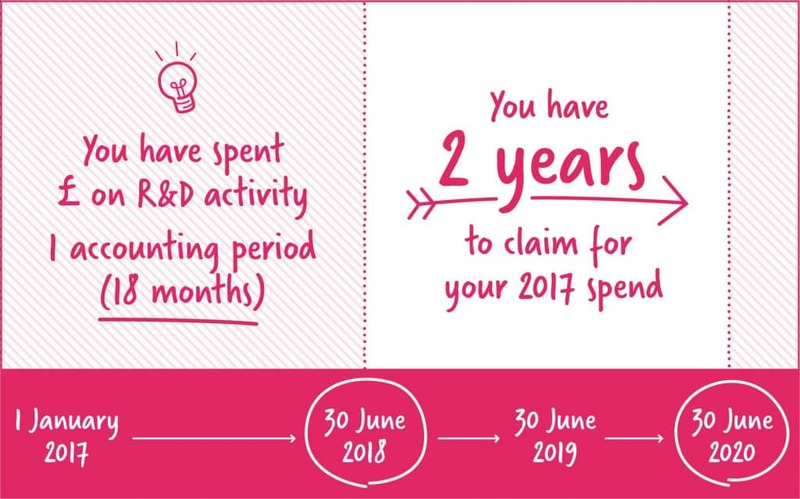 For the purposes of making an R&D tax credit claim, regardless of the length of your accounting periods, the deadline for filing will still be two years from the end of each accounting period. The rules are similar if you change your accounting period end date at any other time. Furthermore, you may have started an R&D project before the earliest period that you can claim for. But if you are still working on the project, and you are still working to resolve scientific or technological uncertainty in your last two accounting periods, then you can still claim for expenditure incurred in these periods – even if the project started before then. ForrestBrown specialise in helping companies navigate the R&D tax incentives: including both SME and RDEC. Our team of chartered tax advisers use their expertise to help innovative companies optimise their R&D tax credit claims and ensure all your qualifying activities and costs are properly identified. The record-keeping support and advice we offer at ForrestBrown is included as part of our service – it’s part of an ongoing relationship we enjoy building with every client. This article was last updated on 23 April 2019.